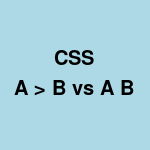 CSS direct child can be specified using A > B and any descendant can be specified using A B. This should be used with care as it can lead to surprises in case there are nested elements in html. Here background color of any direct child is changed to lightgray. Here background color of any descendant is changed to lightgray. This will change color of all descendants including all direct children also.